From the Archive: A British Television Blog: The Box of Delights Part One! The Box of Delights Part One! Last week I mentioned how Christmas specials from our favourite television shows didn’t need to have a Christmas theme to it to still be special. What about when you really want to watch something with a wonderful holiday spirit? After all, tis the season! 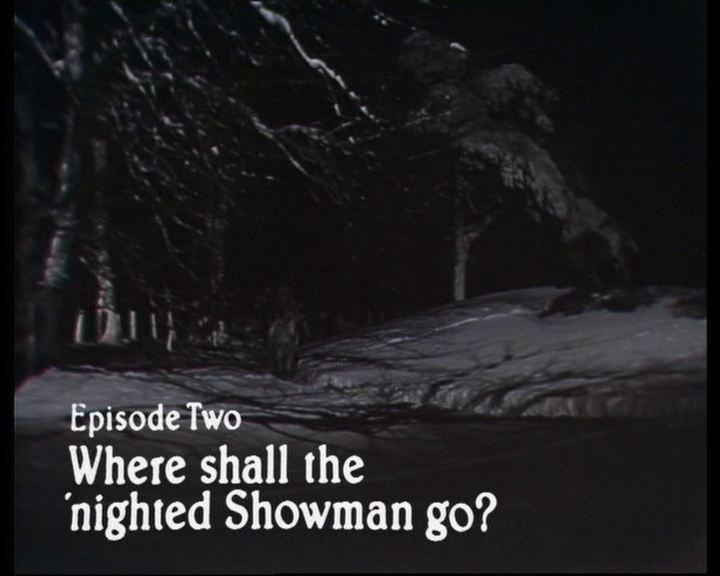 There is something about a Christmas serial that is magical, full of fantasy and takes place in the 1930s. It is children letting their imaginations run wild and there is a beautiful innocence with a great spirit of adventure that is held before the outbreak of World War II. It features wonderful countryside and steam train engines, plus Patrick Troughton. This is The Box of Delights. 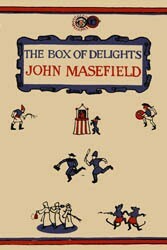 The novel for The Box of Delights was written by John Masefield in 1935. Little did I know that this is actually a sequel to a novel he wrote in 1927 titled The Midnight Folk. I personally am glad I didn’t know this because I think this story is perfect on its own. 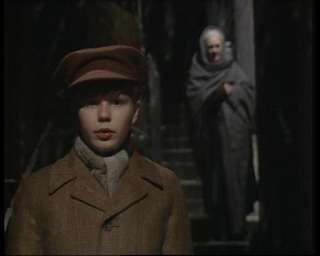 The Midnight Folk also featured Kay Harker who is our main character in The Box of Delights. 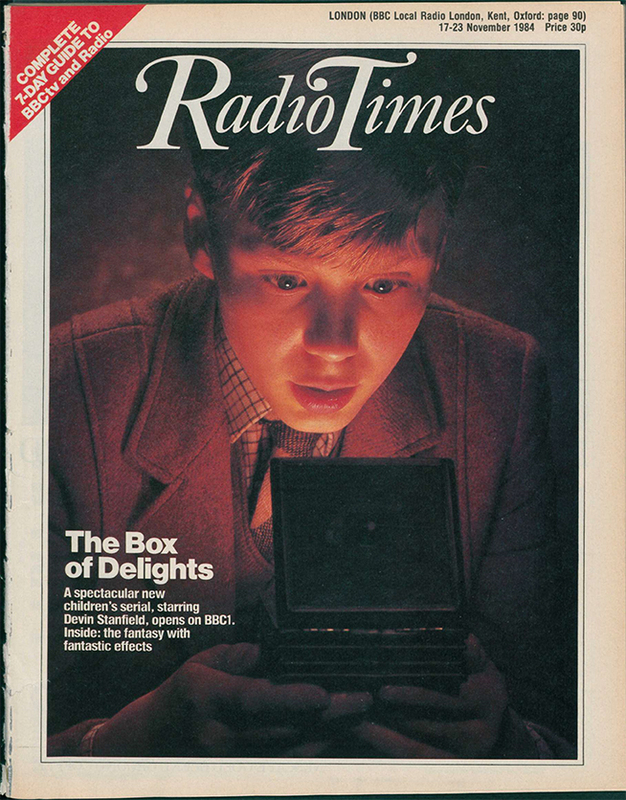 The Box of Delights was originally made the BBC as a radio production in 1943. It was made no less a total of 6 more times on radio between 1943 and 1995. I will touch on the radio adaptations in a later article on this series. 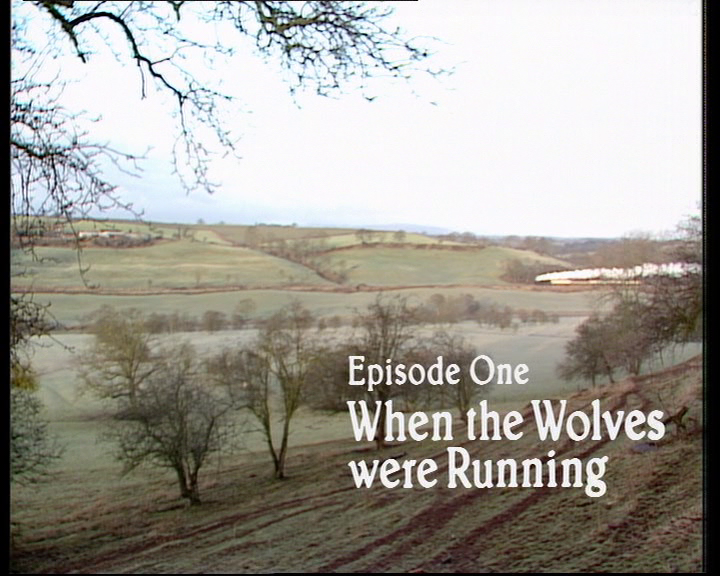 In 1984, the BBC decided to make its most ambitious children’s serial to date. This is the start of a fantastic serial. The story starts with Kay Harker, a young boy, returning from boarding school and is on Christmas holiday with his Aunt. Things get moving pretty quickly on this episode as he meets an old Punch and Judy man named Cole Hawlings and the the two have an immediate rapport together. Strange things happen from the start such as Kay losing his train ticket for his next train but as soon as he tells Cole that it is gone, Kays finds it on the ground by his feet, which is probably the first place that Kay would have looked. Kay is back on the train for the final leg of his journey and meets up with apparently two men of the cloth who turn out to swindle the young Kay in a game of chance as well as possibly pickpocketing him after they get off the train. The first thing I notice is that poor Kay is wearing shorts in this cold December weather but there is no snow on the ground…so far. That will all change soon. The whole opening with the trains is always a soft spot for me and as someone who grew up in the US in the 1970s, I am envious about this means of travel. We have it in the US but never did it seem like an everyday convenience as it is in the UK. When Kay arrives and after he gets pickpocketed, he sees Cole again. Cole needs his help to tell a lady that the wolves are running and that he insinuates that the two “clergy” men are the wolves. What I like about this story is the counter balance between everyday life and a wonderful fantasy world. Of course, everyday life in this instance is perhaps more privileged and takes place in the 1930s. That being said, anything about the manor house or the servants is not a really big deal to the story but rather what I would expect from an English period piece that brings to it a lot of charm. Right from the start of the production, I am hooked. The title sequence is whimsical with lots of shots of the characters we will be seeing in the program. Some that we may not see within the first episode too. What brings it all together is the theme music which is an orchestral rendition of The First Nowell (Noel) which in itself actually kind of sneaks up on you. The sequence ends with a synthesized sting that sounds like it comes straight out of the Doctor Who story Arc of Infinity. Yes, I know I am being very specific. Sure, enough Roger Limb did the music for this production and Arc of Infinity. To me, it’s a little off-putting since that bit sounds just like the moment an Ergon is going to come out of a room a zap someone….but I digress. 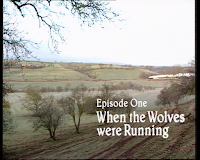 Within this episode Kay is tasked with finding the lady to tell her the wolves are running. He actually finds her fairly quickly as he stops of at a bakers to get some pastry. It all happens rather fast. I am actually surprised with how quickly Kay accepts all that happens to him within a short amount of time but also surprised with how much freedom Kay gets to do what he wants. I do understand it’s a different time period to now. One moment that actually freaks me out for his safety and I am not even a parent, is when he asks the driver to take him into town at night to do some last minute Christmas shopping. He tells the driver not to worry about waiting for him as he will find his own way back. What is even more alarming is that the driver is OK with this. 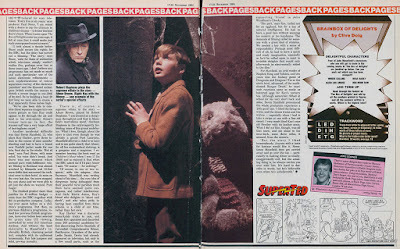 What is funny about that is although it seems alright in the story, actor Devin Stanfield who plays Kay says in the Radio Times article which is attached here that he wasn’t thrilled shooting at night so far away from everything! Kay’s aunt is very easy going too. When I originally saw this production (and having never read the book) I thought she was going to make a big deal out of thinking that Cole would have been the one to pickpocket Kay’s money. When Kay tells her no, she drops it. In fact, she is OK with letting Cole come to the house to perform Punch and Judy. As an American, I have never understood the point of Punch and Judy. That being said, I can certainly appreciate just on the merit of the long history its had. To my UK friends, is this still a tradition that can be seen? How is it received these days? The Punch and Judy show goes well with Cole doing an amazing job of it. Cole is a little uneasy about something; he is uneasy about the wolves. He works in old magic and not new magic like the wolves. At the party, we meet up with the Bishop and their church will be celebrating its 1,000 Christmas service and the Bishop would like Cole to attend to perform Punch and Judy there for the celebration. The Bishop is played by John Horsley. John also played Doc Morrissey in The Fall and Rise of Reginald Perrin. As you could imagine, I was very disappointed when the Bishop didn’t ask Cole if he was feeling a bit chesty. Cole takes his leave of Kay but leaves with his dog through a painting which is done in a pretty awesome sort of way. The painting enlarges and a donkey comes down the road in the painting to meet him. He gets on the donkey and buggers off. This is one of the things that really stands out for this production. There is a great use of animation alongside live action throughout the whole production. This production is very complex and kind of reminds me of The Hitchhiker’s Guide to the Galaxy in terms which how ambitious it is compared to other BBC productions. 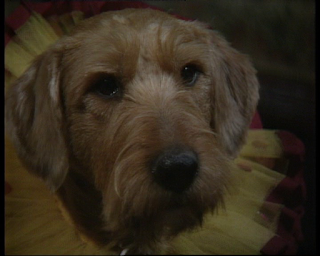 In the middle of the night, Kay awakens and realises he needs to go to King Arthur’s Camp. He finds a horse waiting for him in the backyard. He takes the horse and goes to King Arthur’s Camp which he has never seen before. It is lively as he sees lit campfire from the inside and he can hear people. He realizes he can jump the horse but when I say jump, it is more like flying. When he gets in the camp, he can see people are being terrorized by the wolves! This second part picks up with the action at King Arthur’s Camp. We see Kay weilding a sword and he is swiping and stabbing wolves. Well, to be honest we don’t see that but it is inferred. I think it is inferred. It actually looks like Kay is having the time of his life. He is literally taken away from the action as we meet up again with Cole who has more to discuss with Kay. Cole gives Kay the Box for safe keeping. It turns out that it is not Cole’s box either. He explains a little more of what is going on plus how to use the box to either go small or go swift. As Cole leaves him, Kay is already facing an impossible situation and is told by Cole to go swift which is turning the knob on the box to the right. Kay is with a friend as they are outside near the forest in a field. They see Cole trudging through the snow. Making his way to somewhere. What ends up happening is that Fox Faced Charles and Chubby Joe kidnap him and throw him into their car which becomes and airplane. The airplane takes off to the amazement of the two boys. As one could imagine, if the boys see a crime where else should they go except to the police. There, they speak to the Inspector played by James Grout. I may have mentioned it before but James Grout was one of my favourite character actors who had memorable roles in such series as Rumpole of the Bailey and All Creatures Great and Small. I wrote about him in a role he has in an episode of Dixon of Dock Green. 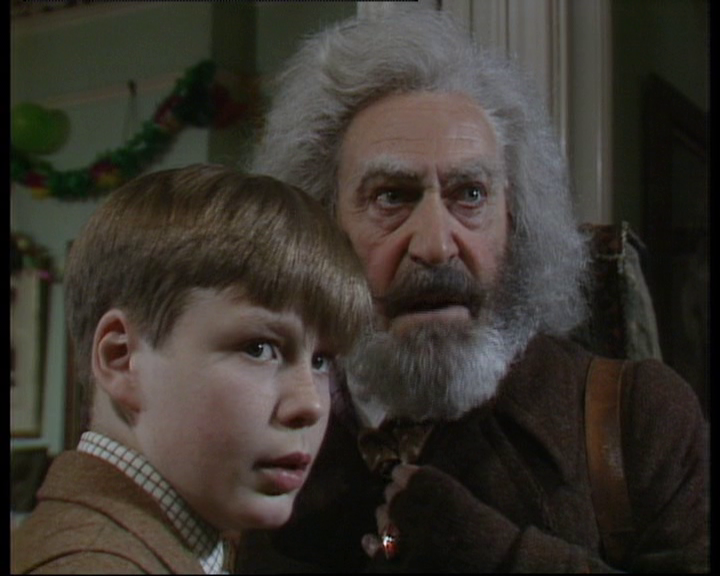 The Inspector is a nice man who cares about the two boys and apparently shares an enjoyment of magic with them but he was not taking their story very seriously. Finally, he gets a call from another station that has Cole there and Kay is able to speak with Cole on the phone. Well, there is a bit of luck and a big coincidence! It sounds like Cole but there is no warmth to him at all. Is it really him or is he being forced to be on the phone? Also, why is it in the UK people say good bye twice on the phone? Goodbye, goodbye. I have noticed this before when speaking to people from the UK but never understood why. After going back home, Kay takes the Box and goes into his room. He opens it up and has a big adventure with Herne the Hunter as they become dear, birds, fish, etc. 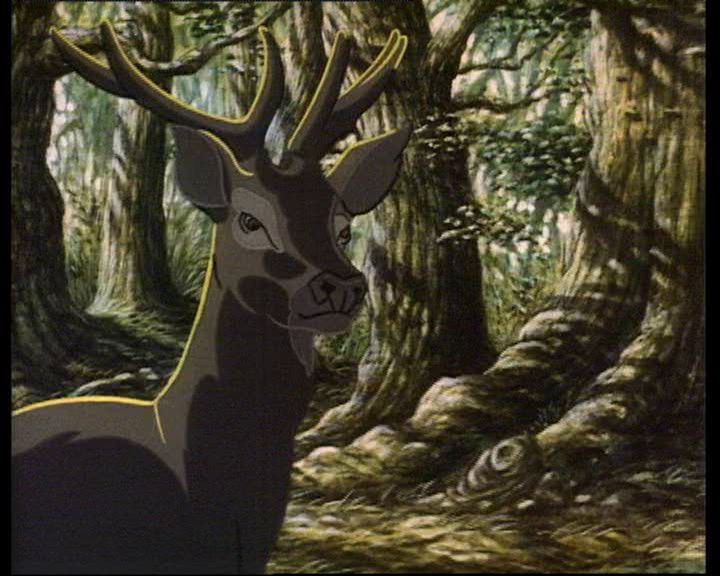 It’s a really enjoyable sequence as Herne is experienced with knowing there are bad things in the forest with Kay being too taken by everything that is going on around him. Once Kay returns to real-life only about 2 and a half minutes have passed. He knows he needs to go to a room at a pub to see what is really going on and possibly get more information on Cole. Kay uses the Box by turning the dial to the left to make him go small. He becomes really small and gets under the floor to beneath the house. There he meets Mouse. Well, he doesn’t meet Mouse because it is clear that he knows Mouse. They are very friendly with each other. Mouse is kind and is actually ice skating. Kay wants to go to the room in the pub but it is so far away plus there is the fear of pirate rats! Mouse really doesn’t want to go. Kay tells Mouse not to worry as it won’t take as long as he thinks. Along their journey they run into Pirate Rats. These are nasty mean rats who want to cause trouble but as always Kay has a plan. While taking Mouse’s hand he turns the knob on the Box to the left and they go swift. They take off and fly through the cracks and passages until they stop at the room they need to go in this pub. In this room, there is Abner Brown, Foxy Faced Charles, and Chubby Joe in a room at the pub discussing about how they want to get Kay out of the way. 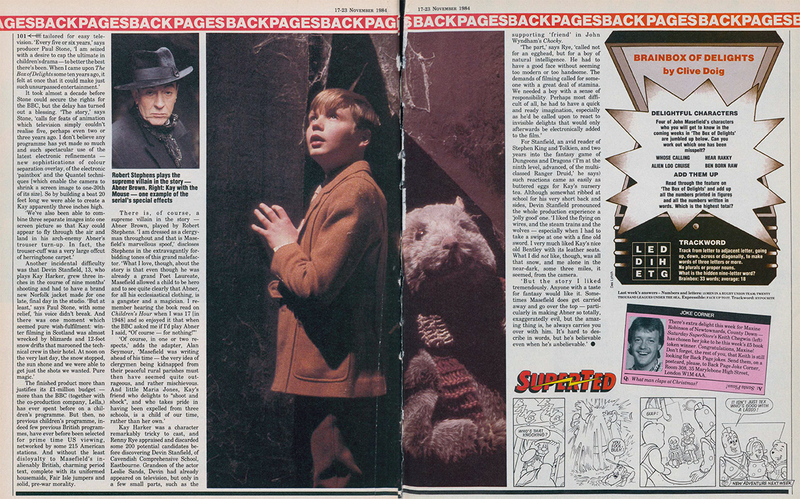 If you look through the Radio Times articles that are attached to this article, there is an interview with the Director of this production, Renny Rye who says that this is the most expensive children’s serial made to this point costing £1 million for the BBC. This incorporates animation, Quantel video effects, practical costumes and masks. Once again, just like The Hitchhiker’s Guide to the Galaxy which was ground breaking for its time. 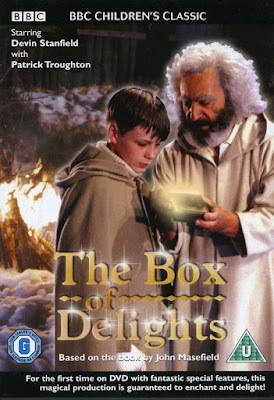 The Hitchhiker’s Guide to the Galaxy has been re-done and so could The Box of Delights. The question becomes, should it? It would be really easy to make updated effects but do I want that? I am fine with serial as it is. I love the performances of the actors. It’s probably too outdated now to be shown on mainstream television which would be a shame. Everything about this production is magical and fun. Also reading the Radio Times articles, it mentions how Devin Stanfield (who plays Kay) grew 3 inches during production and I think it is really obvious just in the two episodes I watched. When Kay and his friend is watching Cole being taken by Chubby Joe and Foxy Faced Charlie outside in the snow I thought that it was a different younger kid than Kay out there. He looked younger and shorter, at least to me and I remember thinking that well before I even read the article. I guess that’s bound to happen making long-term television with growing boys! 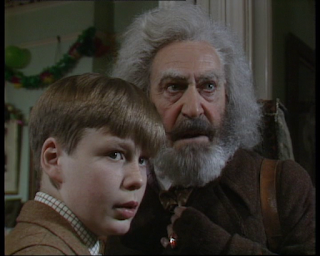 In the US, The Box of Delights aired as part of the series over here called WonderWorks. 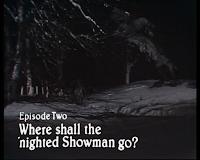 It was co-produced by the Walt Disney Company and a few PBS stations and showed a few television classics such as Anne of Green Gables and The Chronicles of Narnia. It was co-produced by the local PBS station in my area KTCA. The image of the opening title sequence to WonderWorks sums up my feeling of PBS and in the 1980s. It seems so PBS to me because it looks experimental but literally full of wonderment. It’s just what I thought PBS stations were like in the 1980s. 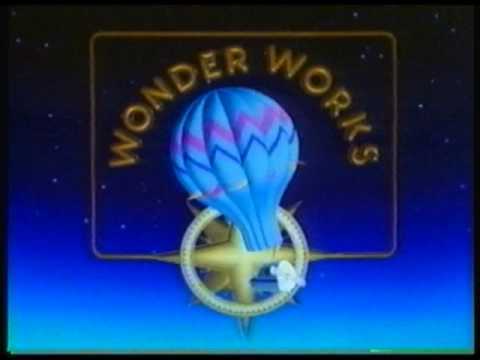 I shouldn’t get too nostalgic for it, I never watched an episode of WonderWorks. That’s hardly surprising. That being said, somehow I am still nostalgic for that time. Next week: We continue on with our look at The Box of Delights. We look at episodes 3 and 4 In the Darkest Cellars Underneath and The Spider in the Web. We will look at the episodes but also take a look at the numerous radio adaptations from over the years and how they are link in some way. 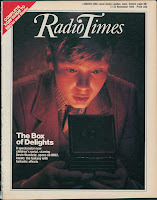 Plus the usual addition of Radio Times materials. 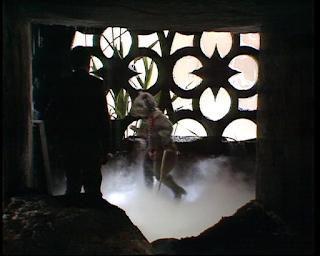 I saw this on WGTV in Atlanta on the Wonderworks anthology, where it was edited into three parts, and made at least eight or nine copies of it back in the VHS trading days for rare Doctor Who stuff. Fun times, somehow, despite all the work. An excellent article as always! 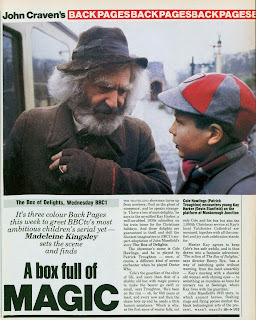 I was hoping you'd cover 'Box Of Delights' one day in your fantastic blog one of these days, it is a very magical series. Great to see all the old cuttings again especially. One snippet of trivia you might be interested in is that actor Nick Berry, who ended up in the series Heartbeat, started his acting career here 'playing' one of the pirate rats - or at least waving a sword in the air and grunting! As a UK reader I can tell you that most of us never quite understand punch and judy either. It's probably the modern equivalent of violent video games or video nasties, with a few religious metaphors in there somewhere. You don't see them very often at all nowadays - they're sort of at the level circuses are now where you see the odd traditional one at a seaside resort but not very often. Thanks for the kind note. I'm glad I am not the only one who doesn't get Punch and Judy. I was afraid I was going to offend people if I didn't appreciate it. 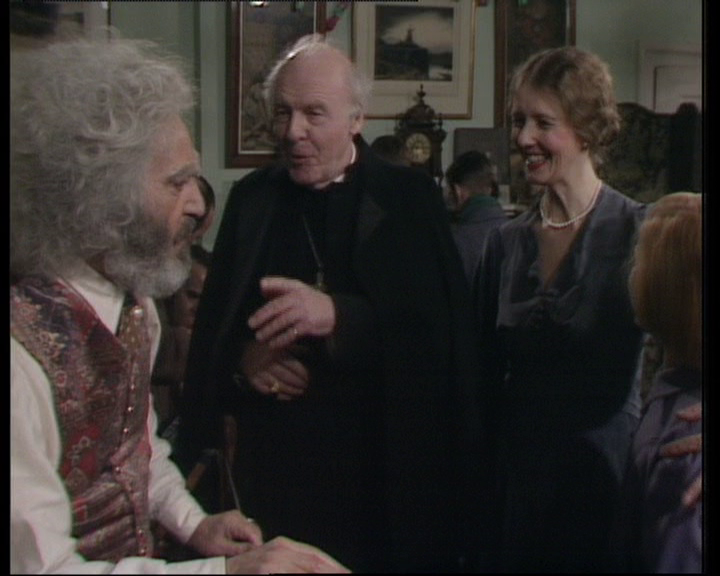 That being said, I should probably watch one full performance instead of judging it from the Are You Being Served? episode The Punch and Judy Affair. Actually, I wouldn't judge it on that.